March 8, 2019 UPDATE: Over the last few weeks, lawmakers, residents and visitors have all chimed in on their opinion for the official name for the new bridge that replaced the Herbert C. Bonner Bridge opening in late February. Throughout the last couple months, Dare County had opened the debate over the name up to the public for input, even creating a submission form on their county website. One popular suggestion was to name the bridge after Captain Toby Tillet, the original ferry captain who transported people to Hatteras Island before the original bridge was built. The name "Marc Basnight," submitted by the Dare County commissioners, was considered a high contender due to favorable public opinion for his contributions to the local area. Many individuals even thought it best to simply call the new bridge the "Oregon Inlet Bridge," for the body of water it covers. With all of these suggestions came a strong opposition from many island residents who didn't want to change the name at all. One Hatteras Island resident, Jayson Collier, even created a Facebook page in opposition of a new name. The page was called "KEEP It Bonner," and his petition received statewide media coverage and over 1,300 signatures in just a few short days. Despite this opposition, the NC Board of Transportation unanimously voted and yesterday afternoon, it was announced that the official name of the new bridge is The Marc Basnight Bridge. Who was Herbert C. Bonner? Born in Washington, North Carolina in 1891, Herbert C. Bonner was a veteran of the US Army during WWI. For several years, he served as secretary to Congressman Lindsay Warren and eventually became a member of the US Congress himself serving 12 terms between 1940 and 1965. He is credited for both helping to establish the Cape Hatteras National Seashore and for advocating for the construction of a much-needed bridge over Oregon Inlet. Another North Carolina native actually born in Manteo, Marc Basnight was a chair member on the Dare County tourism bureau between 1974 and 1976 and then served as a member of the NC Board of Transportation from 1977 to 1983. In 1984, he became a NC State Senator for the 1st District and served until 2011. Along with his many political achievements that helped the coastal community, Mr. Basnight is also well known for the Nags Head water-front restaurant, Basnight's Lone Cedar Cafe, that he and his family still own. While both men's contributions to Eastern North Carolina may be deserving of a local legacy, the decision to change the name of such a well-known and important bridge still comes as a shock to many, especially considering the "new" bridge is literally parallel to the old one. Whether accidental or intentional, chances are that most people who have been driving to Hatteras Island their whole life won't be dropping the name "Bonner" when referring to the new bridge anytime soon. New Bridge Officially Opens on 2/25/19! February 25, 2019 UPDATE: As travel lanes were being painted over the last week, everyone knew it was just a matter of time. Now, the time we've all been waiting for is finally here. As of today, Monday February 25, 2019, the new Herbert C. Bonner Bridge replacement bridge is officially open to the public! Shortly after 12 noon today, NCDOT made the following announcement on its Twitter account: "IT'S OPEN! The new bridge over the Oregon Inlet is open for traffic. Please be safe and enjoy tour travels." (NCDOT). The formal bridge dedication is scheduled for April 2, 2019 but vehicles traveling across Oregon Inlet will now enjoy the 2.8 mile-long replacement bridge that reaches heights of over 90 feet above the water and was built to last 100 years. While "Marc Basnight Bridge" is the most likely contender for the name of the new bridge, many residents and visitors are lobbying to keep the name the same. Meanwhile, most news outlets across the area are referring to the replacement bridge as simply "the bridge over Oregon Inlet" until a new name is offically chosen. Demolition on the old bridge is scheduled to begin later this year and should be finished before 2020. While concrete from the old bridge will be used for reinforcing existing reefs, about 1,000 feet of the bridge will be saved as a pedestrian walkway. February 8, 2019: If you’ve visited Hatteras Island over the past few months, you’ve undoubtedly seen construction crews hard at work at replacing the Herbert C. Bonner Bridge. For the last two years, as they drive along the old bridge, residents and visitors alike have been staring up in awe at the towering new bridge patiently awaiting its opening. These past few years may have been filled with lane closures and other complications but the replacement bridge project, which first broke ground in March 2016, is finally coming to a close. The Herbert C. Bonner Bridge connects Hatteras Island to the northern Outer Banks via N.C. 12 across the Oregon Inlet. Originally opened in 1963, the construction of the Bonner Bridge brought mainstream tourism to Hatteras Island and made it easy for residents and visitors to commute back and forth between the northern and southern Outer Banks. Unfortunately, like all structures in the area, the Bonner Bridge was not immune to harsh environmental conditions ranging from summer storms and high winds to nor’easters and hurricanes. Notably, the Bonner Bridge also sees an average of over 10,000 travelers a day during the summer months. Considering the bridge is the only way to access Hatteras Island by car, it’s no surprise that the deteriorating conditions of the bridge were a cause for concern. Plans for replacing The Bonner Bridge actually began over 28 years ago when it was first added to NCDOT’s priority list of transportation improvements. Originally designed to last just 30 years, the nineties came and went without a solid resolution to the updating of the bridge. As traffic increased with new tourism and years went by with continuing weather damage, a study in 2007 reported the Bonner Bridge had a 2 out of 100 sufficiency rating. This alarming rating launched replacement plans into high gear. After ongoing years of environmental impact studies, lawsuits and weather issues, construction first began on March 8, 2016 by contracting company PCL Civil Constructors Inc.. The new bridge runs parallel to the existing bridge to the west and spans 2.8 miles long. According to NCDOT, the bridge is constructed with modern engineering features that will give it a 100-year life span including high-durability concrete, stainless reinforcing steel and longer pilings. To address traveler safety concerns from the current bridge, the new bridge features two 12-foot wide travel lanes with 8-foot wide shoulder space. For mariners, the new Bonner Bridge includes seven different navigational spans that are much longer than on the current bridge. Construction of the bridge cost an estimated $246 million. Originally scheduled to open in November last year, weather setbacks have delayed the schedule several times. However, now that the bridge is connected in both directions, the construction is finally wrapping up. Final road paving to connect the bridge to N.C. 12 will occur over the next month. Motorists are urged to remain on alert as this is still an active construction zone and speed limit reductions and lane closures may be in effect. According to NCDOT, current finishing touches include completing the barrier railings, completing power lines underneath the bridge, and painting lane markings. Once these projects have been completed, officials will determine the official opening date. Either way, as long as construction continues on schedule, the new bridge should be open to traffic by the end of February 2019. A formal opening ceremony is currently being planned and expected to occur in April but there has been no date announced yet for this event. A intermittent ceremony will occur this weekend, February 9, 2019, when pedestrians and bicyclists will be allowed to cross the bridge between 10 AM and 4 PM. What does the opening of the new bridge mean for your vacation? While there are plenty of fun activities in the northern Outer Banks, a day trip down to Hatteras Island should definitely be part of your itinerary. From water sports and fishing to bird watching and long walks on the beach, a trip over the new Bonner Bridge is sure to bring an exciting new experience to your vacation. 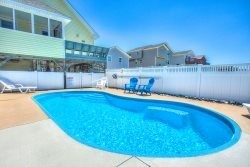 If you’re planning to stay awhile, don’t forget to check out one of our gorgeous Outer Banks Vacation Rentals. We even have a selection of Hatteras Rentals for you to choose from.